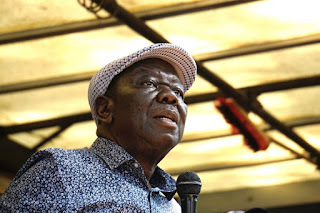 MDC-T leader Mr Morgan Tsvangirai yesterday said he was recovering well despite widespread reports that he was in a critical condition. Mr Tsvangirai, who revealed in 2016 that he had been diagnosed with cancer of the colon, is receiving treatment in South Africa. Rival factions in his party are engaged in a war over visitations. Sources within the opposition party said one of Mr Tsvangirai’s deputies, Mr Nelson Chamisa was the last to visit the MDC-T leader in South Africa last week. However, informed sources within the party alleged that Mr Chamisa was initially blocked by some party members from seeing Mr Tsvangirai as factional wars within the MDC-T continue to escalate. The party is now divided into three factions angling to take over from Mr Tsvangirai, one led by Mr Chamisa, another fronted by Dr Thokozani Khupe and a third linked to Engineer Elias Mudzuri. All three are Mr Tsvangirai’s deputies. Pressed on his alleged barring incident, Mr Chamisa said he was not at liberty to talk about it. He said he has consistently met Mr Tsvangirai to update him on a number of developments in line with the responsibilities he was assigned. However, a tweet on micro blogging site, Twitter under the name “Khupe for Presidency” reportedly run by Dr Khupe’s sympathisers claimed that Mr Chamisa was not allowed to see Mr Tsvangirai. “Lies. Lies. Lies. So Chamisa made another naked lie on Sunday 4 February that he met president Tsvangirai on Friday 2 February 2018. A family member told us that Chamisa was barred from meeting the president. Why all these lies? A lying leader is a liability to the party,” read the tweet. Mr Tsvangirai’s spokesperson, Mr Luke Tamborinyoka’s mobile phone rang continuously without being answered and later was not available. The MDC-T leader, however, posted on his Twitter account saying he was recovering well. “I am shocked to read in the Press that I am in a critical condition. Of course I have cancer and not feeling too well, but I am stable and the process is under control. I have been frequently on twitter of late, I am recovering,” he posted. After the tweet some of his followers wished him a speedy recovery as they raised concerns of divisions in the MDC-T, but others suggested that it was time for him to resign. Mr Tsvangirai’s positive message was, however, refuted by a senior party official who spoke to this paper yesterday insisting that their leader was in a bad shape. “Things are really bad, we continue to pray for him, but things are not looking good,” said the high-level source. Recent tweets by Mr Chamisa also point to serious fights within the MDC-T.